The Summer Camp offers four levels of summer camp programs for girls age 6-18, advancing from 10-day general sessions for first time participants to Hiking and Canoeing, Leadership and Counselor-in-Training programs. Living within a diverse peer group, campers experience a variety of new and traditional camp activities and enjoy spending time in the great outdoors. Our curriculum is specifically designed to meet the developmental needs of young adolescent girls and progresses for returning campers, many of whom return for several summers. General Camp is a 10-day fun and welcoming introduction to camp life, activities, adventures and skills. For most girls, this is their first opportunity to spend time away from home and join a community of peers who, while from different places, share many common life experiences. Counselors guide girls with unconditional acceptance and understanding, as each experiments, explores and builds self-confidence. 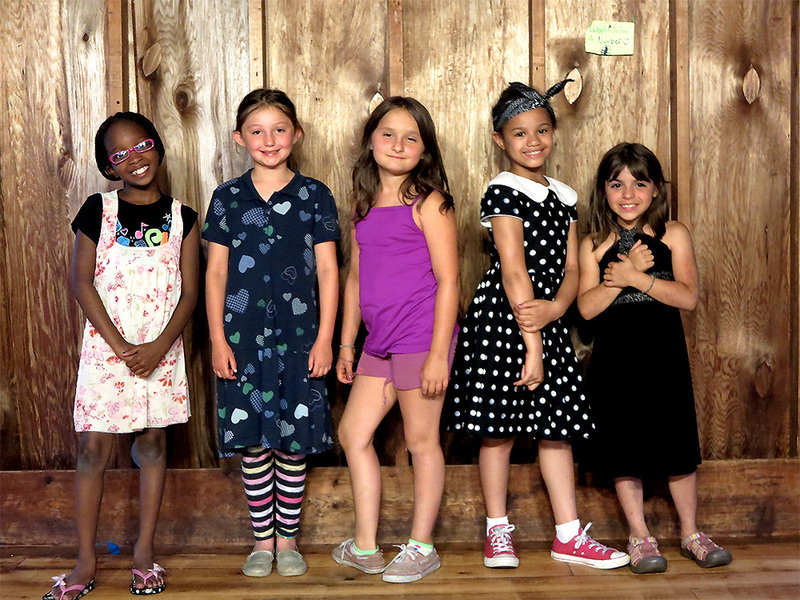 Summer Campers sleep in rustic cabins with nine girls their age and three counselors. Days are filled canoeing, kayaking, swimming, sailing, dance, land sports, photography, drama, archery, pottery, knitting, sewing, arts and crafts, science explorers and adventure day trips. Evening activities include talent shows, scavenger hunts and dancing. Each bunk group spends a night camping in a tent and roasting marshmallows for s’mores over an open fire. Our 13-day Hiking and Canoeing program expands upon skills and personal growth from General Camp, by encouraging girls to trust their peers and practicing team work as they explore by foot and boat. This program focuses on social, athletic and outdoor skills as campers explore Maine's hiking trails and canoe on the Saco River. As girls complete these adventures, they feel the strength of their physical accomplishments and support of trusting bonds of friendship, that often last lifetime. Hiking and Canoeing is specifically geared toward helping girls build self-confidence and coping skills. A Community Outreach Educator works with our Hiking and Canoeing campers in small groups of 8-10, encouraging each girl to believe in herself and abilities. Once the campers complete the Hiking and Canoeing program, they radiate confidence and look forward to embracing new challenges. Leadership Training is a 10-day session deepening campers' skills, knowledge and self-awareness through advanced activities and workshops designed to help girls make mature decisions regarding issues that affect their lives. Workshops include: healthy nutrition, safe and effective communication, drug awareness and prevention, American Red Cross Babysitting, healthy family planning choices, nonviolent conflict resolution, job application, interviews and professional behavior. Leadership campers also explore higher education opportunities through college visits and continuing education discussions. Leadership trainees help plan special activities for younger campers, assist the counselors and work with a diverse group of inner city and rural teens as they volunteer at the Good Shepherd Food Bank, Washington Manor (a residential care facility) and the Humane Society of Knox County. Young women who complete two years of the Leadership Training program may be invited to apply to return as Counselors-in-Training. Our Counselor-in-Training program (CIT) is for girls who have completed the Hiking and Canoeing program and two years of Leadership Training. Using skills learned during previous years at camp, CITs accept responsibility for providing a safe, fun and enriching environment for the General Campers. The CITs work alongside camp counselors, assisting them with their everyday duties, including caring for the younger campers. Most CITs attend two consecutive General Camp sessions. Upon successfully completing two years of the CIT program, reaching the age of 18, and exemplifying mature decision making skills, many of our CITs return the following years as general counselors, providing guidance and support to girls in need, as they once were. The Summer Camp’s Literacy program is uniquely designed to provide academic support and encouragement, assuring girls of their personal and academic strengths while specifically helping to increase literary ability. All campers and CITs, many of whom are reading below grade level, benefit from our Literacy program, which includes reading, journaling and creative writing. At the end of each session, every Summer Camper receives a book to take home—a gift from The Patrina Foundation. Wake up time is between 7:30 a.m. and 8:00 a.m. Campers are scheduled for six activities each day-three in the morning and three in the afternoon. Rest hour follows lunch each day. Every evening the girls participate in an activity such as a counselor hide-and-seek, dance, talent show, campfire or swimming. Three nutritious meals are served daily. A snack is provided after the evening activity. Lights out is at 9 p.m.